Rubberflex Arena S -- Heavy Duty Flooring that is Ideal for use in weight rooms, cardio area, entry halls, lobbies, and all other high-impact areas including ice skating rinks, pro shops, locker rooms and golf facilities. & Arena HG (hammer-grained speckle) are the perfect choice for your high traffic areas that demand durability and a touch of class. Ideal for use in weight rooms, cardio area, entry halls, lobbies, and all other high-impact areas including ice skating rinks, pro shops, locker rooms and golf facilities. Available in 1 m x 1 m x 3/8 tiles. Arena " S" is extremely durable and resilient. Its tough standards combined with its attractive color choices makes it an ideal choice for fitness facilities, multipurpose rooms, cardio areas, and more. 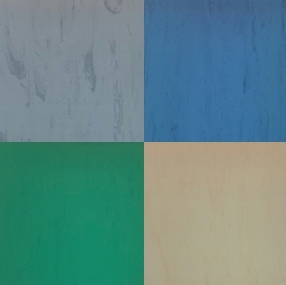 Arena " S" tiles are available in the four colors (shown here below left), plus in "custom colors"! The tiles are designed with a marbleized grain look, and have a smooth finish. Each tile is 3/8 thick with dimensions of 39 x 39. Arena S is for indoor use only. Arena™ products are imported from Italy and are of the highest quality. If you want to add a touch of color to your facility, let us show you how to liven up your floors with Arena HG and Arena S.